Summer is almost here, and you know what that means: sleeping in, road trips, and wasting the day away by the pool. After all, this is your last summer of freedom before entering the year-round working world. It's a great idea to embrace what will soon be the last of your college years, but don't let this summer pass you by, or you just may miss a golden opportunity. So, while you're taking a break from the pool to let your sunburn heal, take a moment to do something that can positively impact your future. Network: This one's easy: Networking doesn't have to be intimidating or hard work. It can actually be quite fun to go to events and meet new people in your community. They might not be keg parties, but have a good time seeking out parties, charity events, and other get togethers where you can get to know the professionals you'd like to work with in the future. They can help you land a job, launch your start-up, or provide guidance along the way. Make sure you're on track: If you haven't already, you should check, double and triple check your requirements for graduation. Nothing would be more tragic than expecting a diploma to greet you next summer, only to find out you're just a few credits shy. Talk to your academic advisor, check out your school's catalog, and be absolutely sure of what you need to take care of next year. Snipe the best classes: On a similar note, as a soon to be graduating senior, it's essential that you make it into the classes you'll need to complete your degree. So this summer, make sure you know when the course listings come out, and be among the first to build select classes for the fall semester. Identify and meet recruiters: Get to know recruiters in your chosen industry. Let them know you'll soon be hitting the job market so that they will be familiar with you when it's time to start looking-and remember to follow up when that time comes. Intern: Yes, it might put a dent in your busy schedule of sleep and partying, but taking on an internship is easily the most valuable thing you can do this summer. Do your time and work with a company that you'd like to be a part of in the future, and you just might find yourself with a job offer before graduation comes. Look for one that works with your schedule, while still satisfying your needs for experience and networking. Let your friends enjoy their hangovers. If you take these steps, you may find yourself enjoying a nice paycheck next summer. By taking on these helpful summer tasks, you'll be well on your way to a successful senior year and a promising future upon graduation. Be sure to enjoy your last college summer, but don't forget that now is the time to plan for the successful career in your future. This guest post is contributed by Angela Martin, who writes on the topics of Career Salaries. She welcomes your comments: angela.martin77@gmail.com. This is for those of you who've just completed an internship--or other gig you enjoyed. Find yourself wondering: "What's next?" or "What am I going to do next in a rotten job market?" Take a deep breath: Here are five strategies to make your last experience work for you even if it's over. 1. Be vocal about your interests for future additional work together--if it is a possibility. If a short term position was a worthwhile experience for you and you are interested in working for the organization in a full-time capacity, let your supervisor know. Internships can be a major pipeline for full-time hires--even in a down market: in 2008, 36% of all employment offers reported to the National Association of Colleges and Employers were made by companies to former interns. 2. Ask for a written recommendation that you can keep--or better yet--store in a credentials file at your institution so that it can be sent out on your behalf in the future. (Remember that employee transition is relatively common: your supervisor may decide to move on from the company--and you don't want to lose a record of what you've done). 3. Update your resume and ask your supervisor to help you in describing what you've done. Your supervisor should be able to help you articulate the impact of the concrete tasks you've performed: What was the significance of your work on the organization as a whole? During my college years, I experienced this first-hand after an internship at a Fortune 500 company that specialized in paper manufacturing. One of my major responsibilities was to edit the corporate phone book. This involved calling company employees all over the world (but mainly in the U.S.) to verify their phone numbers. It wasn't the most exciting project ever, but when it came time to write it up, my supervisor changed my resume description of "verified numbers for company phone book" to "One of two employees responsible for accuracy of information in corporate telecommunications directory for multi-national corporation." Which sounds more impressive to you? 4. Stay in touch. One great way to do this is to follow-up with your previous employer with periodic updates on what you are studying and your interests, as well as by providing information that is of interest to them. For example, if you find an article online or stumble across an item you feel would be of potential interest, forward the URL and let them know that you are thinking of them. Follow these tips and you'll be on your way to helping your short-term opportunity "have legs" that will help you progress more rapidly as you start the next phase of your career. If you are graduating in 2010, don’t miss out on one of the biggest opportunities of the year: summer internship recruiting begins now! Many corporate employers use internships as a primary pipeline for hiring for full-time positions. As a result, they will keep their internship programs strong even in a down economy. 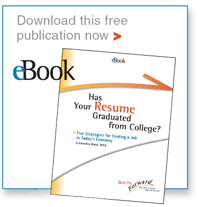 According to annual surveys conducted by the National Association of Colleges and Employers, it's quite likely you'll land a full-time job from your internship: the percentage of interns converted to full-time employees increased from 35% in 2001 to 50% in 2008, with almost 70% of interns receiving full-time offers in 2008. If you haven’t started already, this is a great week to begin. Many campuses don’t open for spring term until mid-to-late January, but a majority of staff at Career Offices are back at work. If your school offers individual counseling appointments or resume critique services, now is a great time to get a quick appointment. If you’d like outside help, you may also want to consider hiring a resume writer or career coach—but keep in mind that you will need to follow resume guidelines set by your campus. Discount the myth that no one reads cover letters. Competition can be stiff, and employers often use cover letters to assess your writing skills and your level of interest. A great cover letter can help you get noticed. How do your skills and experience align with the job description? Why are you interested in the position? How does it fit in with your long-term goals? Quick tip to ensure you’ve written from the employer’s perspective: Count the number of sentences in your cover letter, than the number that start with “I.” Aim for less than 50% of sentences to begin with you. These strategies are designed to help you “stand out” in the applicant pool while also demonstrating how you “fit in” to the company culture and organizational structure. Have any additional tips or success stories of strategies that worked? If yes, please share! 1. Reflect on what you've learned from the experience: how did the internship help you refine your career goals of what you do and do not want to do? 2. If the internship was a great experience for you and you are interested in working for the organization in a full-time capacity, let your supervisor know. Increasingly internships are becoming a major pipeline for full-time hires: in 2008, 36% of all employment offers reported to the National Association of Colleges and Employers were made by companies to former interns. 3. Ask for a written recommendation that you can keep--or better yet--store in a credentials file at your institution so that it can be sent out on your behalf in the future. (Remember that employee transition is relatively common: your supervisor may decide to move on from the company--and you don't want to lose a record of what you've done). 4. Update your resume and ask your supervisor to help you in describing what you've done. Your supervisor should be able to help you articulate the impact of the concrete tasks you've performed. 5. Stay in touch. One great way to do this is to follow-up with your previous employer with periodic updates on what you are studying and your interests, as well as by providing information that is of interest to them. For example, if you find an article online or stumble across an item you feel would be of potential interest, forward the URL and let them know that you are thinking of them. Follow these tips and you'll be on your way to helping your internship "have legs" that will help you progress more rapidly as you start the next phase of your career.